Well, while I’m gone on my cruise I didn’t want to leave this blog idle… so here is a cute picture of Levi’s but at the park when we went this summer. 🙂 He loves the park. He is so good there now. He used to be a terror! When he was young we’d let him off leash and he would run around without listening for a good fifteen minutes. Kinda like Tatum and Muffit do now! But he liked it, and now he comes back and hangs out for treats. He is a great boy. 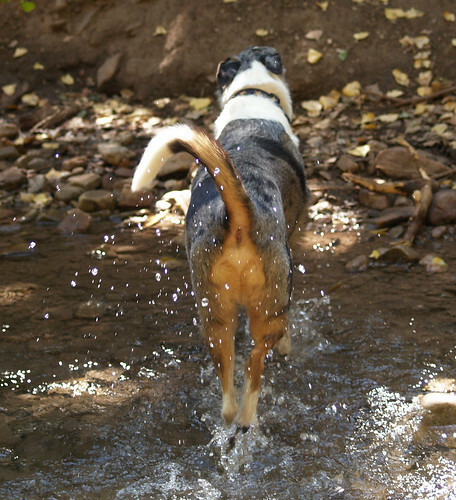 It looks like Levi is trotting away across the stream in this picture not hanging around for treats! My dog had a similar issue when we first started allowing him to run off leash. Every time he would see someone he would bolt to say “Hi” then he would come running back. It’s been 3 years now and he’s pretty used to running around off leash now.. he actually wants to be by us rather than go see other people. Dogs will be dogs though when he spots a squirrel or a cat he is GONE! Levi is a blue heeler mix right? HI Jason, if you looked around my blog you’d see Levi is a smooth collie.. he’s pure bred and a show champion. BTW I deleted your link.. I don’t like to have links to business sites and I almost deleted your comment as spam because of it. Actually, Levi is great and staying close to me, and I can even call him off squirrels and cats. 🙂 Levi is a very good boy! Levi looks amazing! I love the picture of him running. Previous Previous post: Off on a Boat!